Personalized Monogram Alexis Celebrity 18k Gold Over Sterling Silver Necklace. Enjoying the latest fashion trend that movie stars and famous singers have been wearing has never been so easy with the 18k Gold Over Sterling Silver Celebrity Monogram Necklace! One of the hottest trends in personalized jewelry, this round monogram necklace is a funky way to show off your own style and uniqueness. 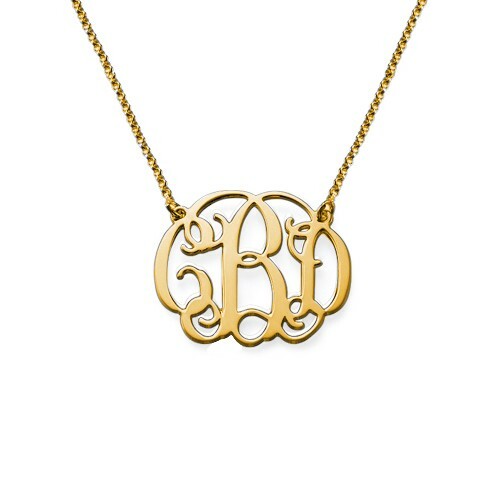 You can choose up to three initials to create this picture perfect monogram piece. This Alexis monogram necklace is definitely going to turn heads when you pair it with any outfit, from casual day time looks to nights on the town outfits. The necklace is made of 18k Gold Over 0.925 Sterling Silver. A monogram is typically structured with the last name as the large initial in the center, the left initial is the first name, and the right initial is the middle name. If you wish you can have the initials any way you wish it to be. Height of pendant: 25mm x 29mm / 1" x 1.13"